Well looky here. It’s another “Make It Good” Challenge. Do you remember what that is exactly? 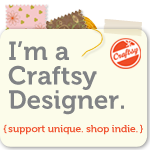 Well it’s a little something Peaches and I cooked up: it’s basically two crafters going head-to-head in a raging craft battle to the death. Okay no. That’s a lie. 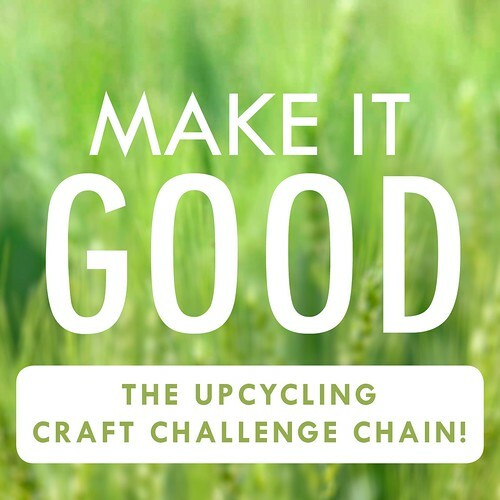 It’s more like two happy crafters happily creating something from some happy recyclable, swapping happy creations, and then happily passing it on. No death. No bloodshed. Just a bunch of happiness. And your job (yes, you) is to check out both creations. That’s it! Nary a winner, nary a loser, see? 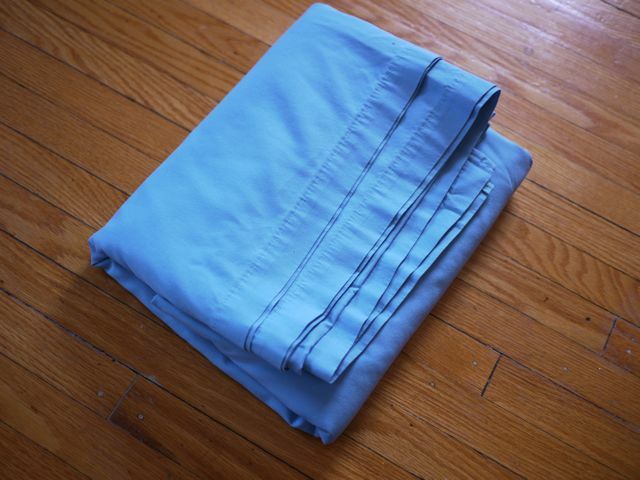 (1) Your one recycled item must be an old bed sheet. (2) And your inspiration is Spring! Alrighty, seems doable… Let’s get ready to rumble!!! Well to be honest, I would have loved to have one of those beautiful old vintage sheets to work with but sadly I’m not that lucky. The only old sheet I had was this blue sheet. This sheet has seen better days. It’s old and worn. And blue. Very very blue. So I decided to make a bag. A bag as blue as a spring sky… True, all seasons’ skies are blue. Details. Mine is as blue as a SPRING sky. Got it? Good. Now when Peaches and I did our very first challenge way back when, she sent me this platter as my gift. When she did, she packed it in a box with many many of these “I Dream of Falafel” bags (You didn’t know you’d sent me 2 gifts in one, did you Peaches?). 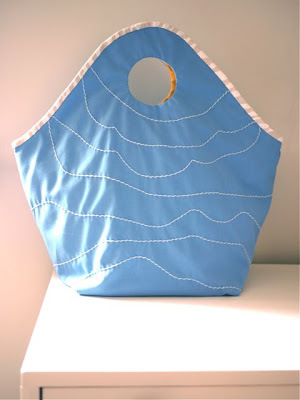 I loved these bags. I liked the pretty flowers on them. I liked the fact that I had a whole collection of them. 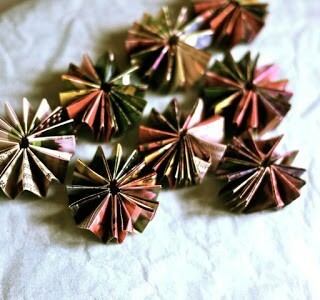 And I loved their shape. Their shape was perfect. I knew that one day I would use them in a craft. And that is what I did. I trimmed a teensy bit off the edges of three of the bags and opened them up like this. I made a 3-layer sandwich and sewed them all together. I used them as a template for my new bag. 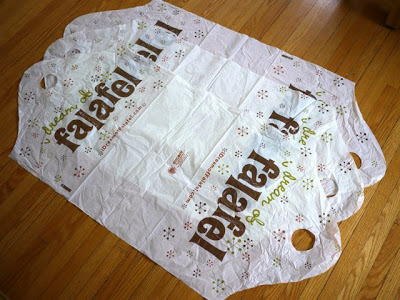 But I also used them as a liner for the bag. You see? It’s a bag-lined shopping bag! I call it my “Sky’s The Limit” bag. Notice that I embellished it with yarn. Those are the sky parts there. There’s the sun right in there too. I hope my opponent will like this bag because it’s all hers! Now please check out what Alex made. I’m very curious! She mentioned something about clothing… Can’t wait to see what she’s cooked up? I’m going over there now. Join me, won’t you? Okay then, have yourself a lovely day. I’ll see you again soon! P.S. 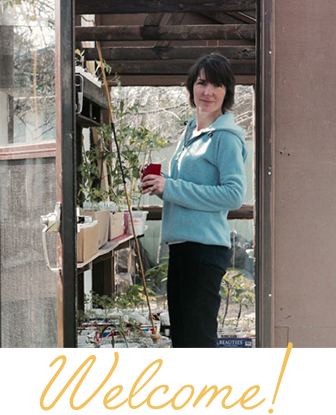 I am SO thrilled to be nominated on Babble Blogs 2011 right here! Would you consider voting for me? Thanks so much! Your bag is awesome, Michele! I love the shape and the color. Beautiful stitching, too. 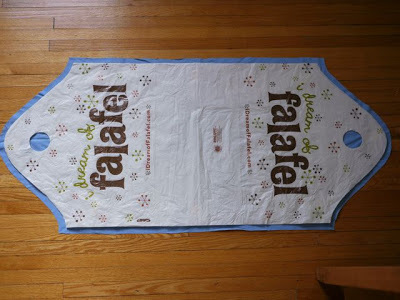 And the shopping bag liner is a fantastic idea. Bravo! Great job on the bag! Thank goodness I wasn't given this challenge. All of our old sheets are used to cover things on the barn and are completely disgusting! 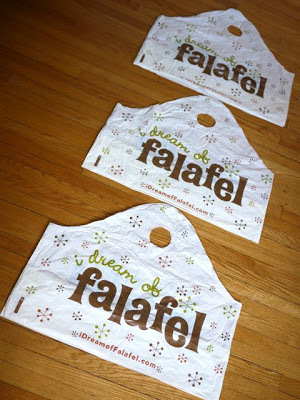 I totally dig the falafel bags – I've never thought of using plastic as a liner – great idea! 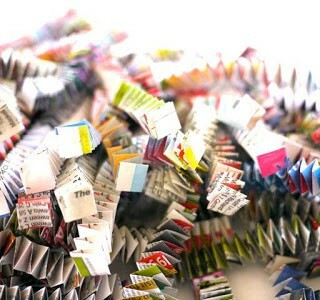 What a lovely multifaceted upcycled creation!!!!!! Every bit of it is wonderful. Would never have seen that use for those falafel bags – so cool! Now off to visit your opponent, and then eat some falafel. 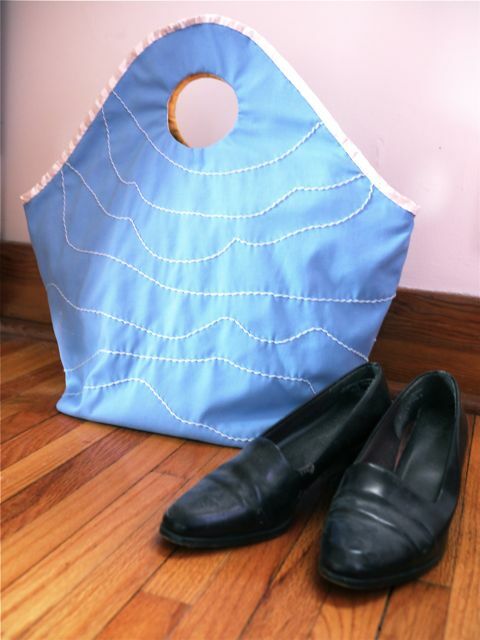 What a fabulous bag! I love the details, the circle handle opening…and I want a falafel! It's been ages since I had a really good one. OOH , I like it too , and now I am going to see the other's creation !!!! DM, you'll love Alex's creation, I'm sure! Ok so first I voted for you my talented friend and I hope you get as high as the sky!! The bag is adorable!! I am reading this with my daughter and she is head over heels in love with this! Fabulous job as always! I LOVE THIS! You know when you see something and you need to make it right away? That's this! 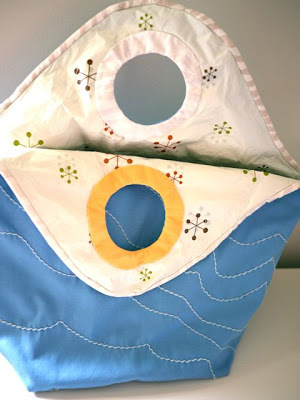 I love the shape, style, lining, and stitching. 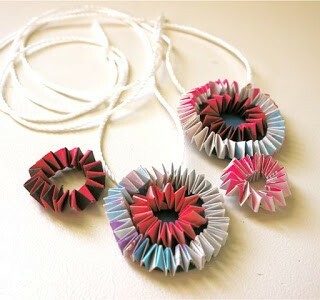 I have to try to make one! So impressed! Hi Elle!!!!!! So nice to get a comment from you! It's your very first one, isn't it? Welcome little one! Brilliant!! 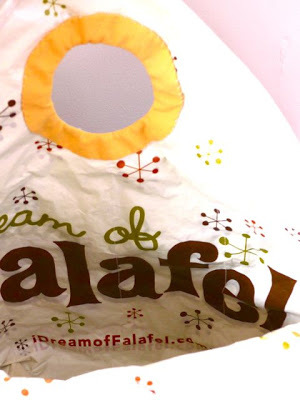 I love your Spring bag, the Falafel lining is pure genius…I loving Alex's ruffle creation too! Love your bag!!! It looks great!! Oh how I love bags made from old items. Really great modern shape. PS I went over and voted for you! thanks KJ, so great of you!